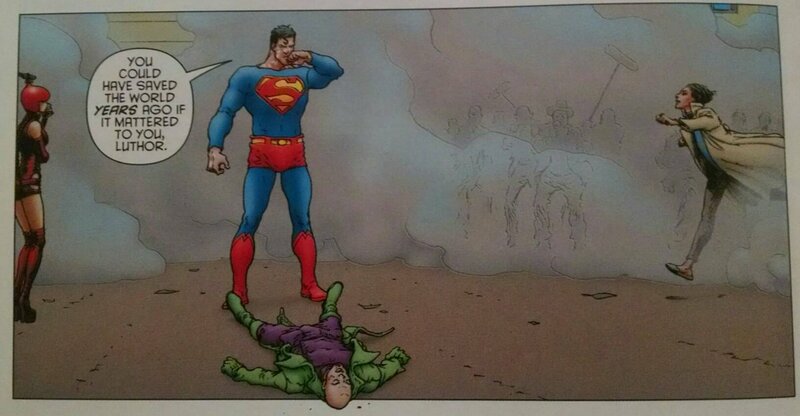 About a quarter of the last issue of All-Star Superman is dedicated to a sequence where Superman, having just died on the floor of the Daily Planet, experiences the Kryptonian afterlife. It’s a sort of blank slate, what-if parallel version of events where Krypton didn’t explode and Kal-El never went to Earth. Superman speaks with his father, Jor-El, and we get the delightfully handwavy explanation that Kryptonian physiology evolved to absorb and store the solar radiation of stars, and Superman is now in the midst of an extreme mutation that’s converting his entire body into “solar radio-consciousness.” It’s a fancy way of saying that, surprise, Superman is not in fact dying; he’s just turning into a being of pure energy. The major tension of the plot gets resolved here; we have our assurance that even though this story is ending, Superman’s going to be fine. All is well; time to beat Lex Luthor. What follows from this setup is a sequence where Superman systematically outsmarts Luthor while also driving home the point that Luthor’s obsession with him is just an excuse for not doing more to try to help the world. We learn that Superman had suspected Luthor’s plan from the moment he noticed one of his robot assistants was malfunctioning, and he has planned everything to play out the way it does in this issue. With Luthor tripping on his own super serum, Superman can’t match him in direct physical combat, so instead Superman goes through a cat-and-mouse game with Luthor, using a gravity gun to force Luthor to work extra hard and burn through his dose of serum much faster than expected. In the end, Luthor has an epiphany about the interconnectedness of the universe just before his powers run out and Superman knocks him out. Unfortunately for Superman, there’s no time to enjoy his victory since the fight with Solaris, the Tyrant Sun, in the previous issue has damaged Earth’s sun; Superman only has seconds to get to the sun and repair it before his body completely transforms into energy, so he kisses Lois goodbye and then flies off to save the day one last time. The issue’s denouement is a short series of scenes showing how Metropolis has adapted in the year following Superman’s departure (Lois refuses to believe he’s dead, and continues to steadfastly wait for his return); Superman, now made of pure energy, happily working the mechanisms he’s installed in the sun’s heart to keep it going; and Leo Quintum unveiling to his assistant Agatha a project to replicate Superman now that they have his complete genetic code. It’s an incredibly breezy final issue, all things considered, and it ends on a really triumphant note, which is really where you want a series designed to represent the core of Superman to go. Everything is hopeful, and we have multiple hints that Earth will be fine going forward. Even Superman, who has been laboring since the beginning under the assumption that he was going to die, is in a position to live happily doing what he loves. There’s even a slight suggestion that Superman has now become immortal, and will continue on far into the future; way back in issue #6, the leader of the Superman Squad from far in the future is a golden Superman who very lightly suggests that he is the same as the original Superman. 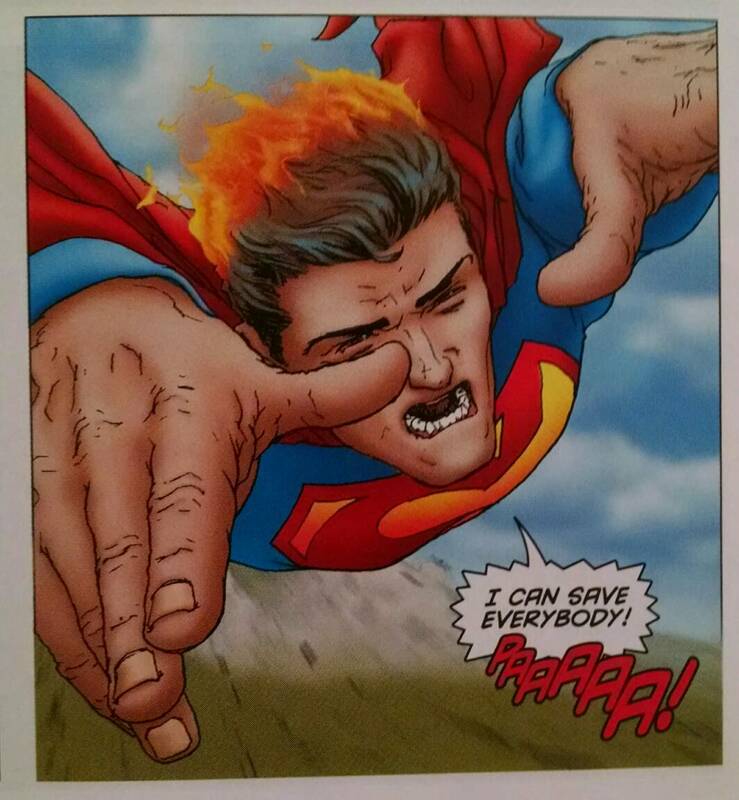 Superman’s final panel where he’s operating the sun shows him in a form that’s very similar to that earlier appearance. In the end, I’m not sure that All-Star Superman holds up quite so well for me in comparison to when I first read it. It hails from the decompression era of comics, and even though Morrison and Quitely do their best to make each issue feel really compact in comparison to contemporary work, the series overall feels much more sparse than other comics that I like; I suspect part of this sense comes from alternating between Watchmen and this comic, since Watchmen, in addition to being from an era when comics storytelling was stylistically much denser, is also a paragon of dense narrative and symbolic structure in its own right. Beyond simple fluffiness of the content, All-Star Superman also suffers from some all too common problems with representation in comics; Lois is an irritatingly flat character except for in that one issue where she gets really paranoid, and the cast as a whole is overwhelmingly white. Individual moments are still great, but the work overall feels diminished when you consider it as a whole. The penultimate issue of All-Star Superman begins with Lex Luthor’s execution, and it ends with Luthor bursting through the wall of the Daily Planet as Clark Kent collapses dead over the headline that Superman has died. In between those two events are a few twists that only really surprise the people who are inside the story; Luthor stole the formula for twenty-four hour superpowers that Superman made way back in issue #2 for Lois Lane’s birthday, and he created and drank it in prison just before he was scheduled to be executed. Solaris the Tyrant Sun, a giant sentient solar computer, arrives and casts Earth in perpetual red sunlight, which should neutralize Superman’s powers. Superman, anticipating that this is his last adventure, finishes putting everything in order and goes to meet his fate. What we get here is an issue that is long on setup for the finale, and short on much else. It’s been obvious since the beginning that Luthor had a plan in place that would allow him to escape prison whenever he wanted (issue #5 was built on the premise that Luthor could walk out at any time, but he was adhering to his own schedule), and so the fact that he survives his own electrocution isn’t particularly surprising for the reader. It’s a nice set piece; watching Luthor ambush the prison guards is a lot of fun; it just isn’t surprising. Slightly more resonant are the brief scenes of Superman closing up shop in his fortress. He leaves behind a lot of things for his robot assistants to care for, including a lot of mementos of his adventures during this brief series. We catch a glimpse of the Phantom Zone mirror where Bar-El and Lilo are rampaging through the hordes of Kryptonian criminals; Superman arranges to have a page of Zibarro’s poetry that he brought back from the Underverse preserved in superlaminate; there’s an entire zoo of animals who were mutated by contact with the Bizarro world that now have special needs. Beyond those things that we recognize just from reading the most recent adventures of this Superman, there are many other things strewn about in the background that highlight just how full this hero’s life has been. Quitely goes above and beyond to make this world lived in by its two central figures; just as we see so much of Superman’s Fortress of Solitude and the history preserved there, we also get a glimpse in this issue of one of Luthor’s hideouts where he’s stowed an impressive number of costumes and battle suits over the years (many in his signature purple and green color scheme). We’re getting ready to say goodbye to these versions of the DC characters, and Morrison wants to take a moment to acknowledge all the history he’s been playing with before getting on with the action. And that’s really the long and short of this issue. It’s mostly setup for the big finale, and that’s perfectly okay. The tenth issue of All-Star Superman is probably my favorite one out of the series. It departs from a standard story arc structure to instead deliver scenes from a day in Superman’s life as he alternates between performing his regular superhero functions and getting his affairs in order for his impending death. The action is split between several different events that comprise the day, and the flow of the story moves non-chronologically as we flash back and forth between Superman dictating his last will and testament in the evening and his accomplishments from earlier in the day. The plot threads that make up this issue can be divided into three categories based on the social scale of Superman’s impact, moving from the very personal up to the communal and on up to the universal. Superman races between crises and duties constantly, one moment facilitating diplomatic negotiations between Leo Quintum and the shrunken inhabitants of the Kryptonian city of Kandor, the next stopping an attack on Metropolis, and the next comforting a suicidal girl who was about to jump off a building because her therapist was unable to reach her in time. The time stamps on the scenes from all of these stories, while initially disorienting, help emphasize just how tightly packed Superman’s schedule is. The urgency of his pace here is underscored by the flashes to the end of the day where he explains that he knows his death is imminent, but he has to complete all of his labors before he can rest. Superman knows he’s on a limited clock, but aside from the flashes of events like him recording his entire genome so it can be studied by Quintum’s PROJECT and his work on a new suit that will be needed for a conflict we’ll see in the next issue, the impression that Morrison and Quitely seem to want us to take away here is that this is just how a normal day goes for Superman. He has immense power to help people, and he throws himself totally into using that power to its fullest potential; the whole practice feels like an echo back to young Clark’s mistaken assertion in issue #6 that he can “save everybody.” This Superman is more tempered than he was in his childhood, but he’s clearly still grasping for that ideal. Sprinkled throughout the accounting of Superman’s work are panels showing the gradual development of human civilization on an Earth located inside a miniature universe that Superman has stored in his Fortress. The purpose of this Earth Q is to provide Superman an opportunity to see how the world will fare without him there to protect it. The glimpses we see show that this Earth Q is remarkably similar to our own Earth as it shows moments reflecting the advancement of thought that leads to the character of Superman as he was conceived by Jerry Siegel and Joe Shuster. This little subplot strikes me as Morrison and Quitely asserting the importance of Superman as a symbol for hope even in a universe where he doesn’t actually exist. What I like most about this issue in particular is that it operates as the central thesis for the All-Star Superman series as a whole. The point since issue #1 has been that Superman always operates in good faith and never slacks off from the responsibility that he’s assumed because of his abilities. This is a fact of Superman’s life that continues in the background of all the adventures we’ve seen him have since he got supercharged by the sun, but the beauty of this issue is how it fills in the gaps between those big milestones. Superman’s helping sick children and saving people from supervillains when he isn’t embroiled in any particularly spectacular conflict that’s worthy of having a comic book issue devoted to it. He is, apparently, inexhaustibly good, but that appearance is cracking here as the toll of the supercharge is catching up to him. Though it never shows when he’s in public, Superman looks incredibly stressed when he’s alone with his thoughts of what comes next for the world. When I think about what makes Superman an excellent character, I’m thinking largely about the way he’s imagined specifically here, rushing nonstop towards problems that need his help because it’s the right thing to do. There’s a moment in this issue where Lois, having thrown herself in the way of a rampaging supervillain to get Superman’s attention, asks Superman when they’re going to have a chance to talk now that she knows he’s really dying. Echoing her confidence from the first issue, Lois has total faith that Superman will find a way to save himself; Superman’s not so confident, but he doesn’t have time to talk. This scene’s interesting because we get to see that the crisis Superman’s flying off to deal with is an important, though small, one. He’s not exactly trying to avoid the subject of his doom (he skirted the issue much earlier when he was treating Lois to her birthday celebration), but it’s definitely not a conversation he wants to have; the way he sidesteps Lois’s complaints while addressing the emergency with the suicidal girl is quite elegant: we get to see a sharp example of how he packs his time for maximum efficacy while also indulging in one of his deepest flaws. Superman is a lonely figure in ways that aren’t exactly tragic (he’s not wallowing the way Batman often does), but he clearly feels an emotional distance from everyone around him. 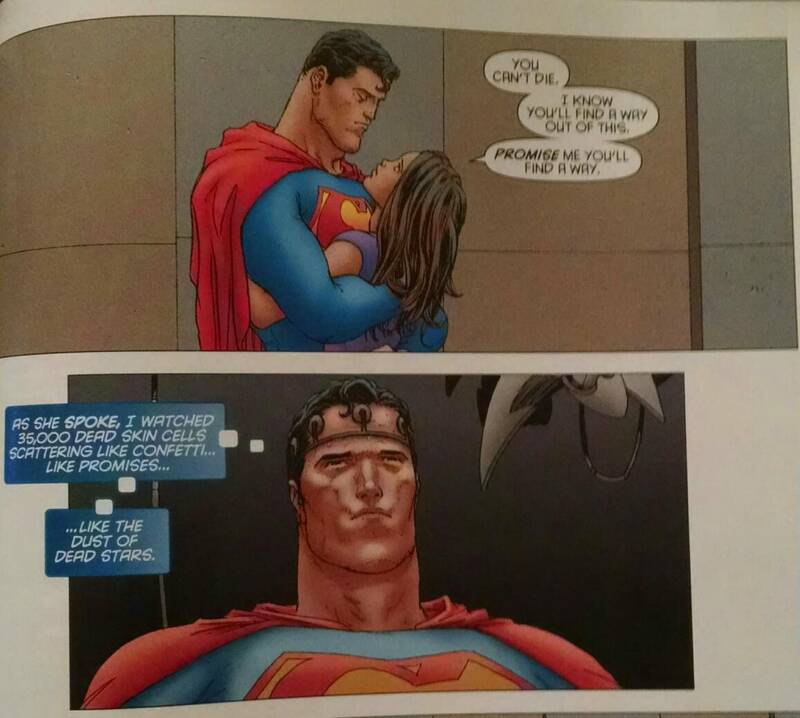 I suspect some element of Superman’s avoidance of Lois (he never talks with her directly about what’s happening to him) and others is meant to be tied back to the trauma of losing his father; that event sits at the center of Morrison and Quitely’s series, and its impact echoes strongly here. Okay, I’ve poo-pooed on a few of the middle issues of All-Star Superman (the more I think about it, the more I dislike the Bizarro two-parter), but I have to say that I actually found myself remarkably taken with issue #9 “Curse of the Replacement Supermen.” Its antagonists, Bar-El and Lilo (I don’t know enough about the Superman mythos to explain why Lilo doesn’t have a house name) are total heels who espouse a blatant form of cultural imperialism. They’re not supposed to be sympathetic at all but their circumstances leave you feeling some empathy in contrast with Zibarro from the previous issue whom Morrison and Quitely want us to like but who only annoys me. This issue starts up two months after Superman disappeared into the Underverse while fighting off the Bizarro planet. In that time, two Kryptonian astronauts who were thought lost in space have arrived on Earth and taken over Superman’s duties as protector of the planet. Their motivations aren’t quite so pure (we see right away that they’re very intent on imposing Kryptonian culture on humanity by fiat if necessary), but they do seem to recognize the value of protecting human life, even if they think Earth’s inhabitants are inferior to Kryptonians. Superman initially tries to reason with Bar-El and Lilo, but he quickly realizes that they hold him in contempt and they are stronger than him (it’s so soon after being trapped in the Underverse that Superman’s still getting his full powers back). He’s forced to retreat, but Bar-El and Lilo track him down to the Daily Planet where they almost out him as Clark Kent before they become grossly ill from kryptonite that has formed in their bloodstream. Superman finds that he isn’t able to cure them, so he sends them to the Phantom Zone where they can beat up Kryptonian criminals all day in perpetuity until he can maybe find a way to heal them. Superman’s totally befuddled by the Kryptonian spires because they’re so obviously out of place in Metropolis, but he has the wherewithal to exposit in a complete sentence for the reader. Where a more contemporary comic might condense Superman’s utterance to something like, “Kryptonian architecture?” Morrison just goes all in on the hokey Silver Age dialogue. The phrase, “my native planet, Krypton,” sells it the hardest, as it communicates to the reader information about Superman’s origin that Morrison has previously dispensed with explaining in detail (his and Quitely’s “four panels, eight words” opening from issue #1 is a relatively famous treatment of Superman’s origin that works because it assumes readers already know the important details about Superman, including his home planet of Krypton); Silver Age comics are infamous for reiterating core character concepts over and over again on the assumption that any comic could be a reader’s first encounter with its hero. Besides all of that condensed awesome silliness, you also have to accept that the issue’s premise (a couple more Kryptonians just drop onto Earth from space and make Superman’s life complicated) is pure Silver Age absurdity (really it’s pretty much superhero absurdity in general, but DC tried to step away from the whole “Superman runs into a bunch of other Kryptonians who survived the planet’s destruction” angle when they realized it was getting out of hand). Also, the fact that Bar-El and Lilo show up at the Daily Planet, basically call Clark Kent Superman in front of his coworkers, and they still don’t make the connection is utterly bonkers; in any other book I’d hate it, but for some reason I find it charming here–probably because I have such a low opinion of the Daily Planet‘s staff that I’m not at all surprised by their obtuseness. The other thing that I like about this issue is that it gets back to the core thesis of the series (which took some weird turns in those middle issues): that Superman is an essentially good person who tries to do right by everyone he meets. This concept expresses itself here in ways that are imminently admirable; Superman explains to Bar-El and Lilo that he has no right to impose his own values on others, particularly when it would supplant other equally valid values. When Bar-El describes Superman’s love of Earth cultures as going “native,” you can’t help but recognize that there’s a postcolonial critique happening, even if it’s only on a very basic level. Superman’s conflict with the Kryptonians culminates with a sequence where they beat him handily and put a fissure in the moon, all while calling him a “soft wee scientists’s son.” This moment crystallizes in my mind the idea that Bar-El and Lilo are supposed to be obnoxious bullies from space while Superman is the sensitive, nerdy kid. It’s a funny setup, particularly since Superman is portrayed as so physically in control of himself and his surroundings in all other scenarios, but it rings true as an extension of what Superman values from the heritage his parents left him. That the issue ends with Superman choosing to actively try to help Bar-El and Lilo with their illness after they essentially declared their intent to colonize Earth as New Krypton is pretty moving. I’m not sure if the Kryptonians actually would change their tune if they were to get better, but the fact that they’re at least not genocidal (unlike another villain that Superman might have been a little too easy on back in issue #5) suggests that there’s hope to reach them. Still, it’s probably for the best that they’re trapped in the Phantom Zone and it’s not within the purview of this series to explore what Bar-El and Lilo would do if released. At my old job I had one student who was fascinated by superheroes and the differences between their comic book versions and their movie versions. I don’t think he actually cared to read comics himself, but he was enamored with the wide array of trivia that exists surrounding pretty much any character that exists under the Big Two comics publishers. Because I happen to have a pretty great love for the medium and the superhero genre myself, I enjoyed telling him about all the little tidbits that I knew about any given character he took an interest in. One time, probably in the months of hype leading up to Batman v Superman: Dawn of Justice (still haven’t seen it! ), this student learned about the weirdness that is Bizarro, an old Superman villain who hails from a planet that’s exactly the opposite of Earth. Bizarro is the name of the race of aliens on this Bizarro-Earth, and all of the members of this race are polar opposites of people on our own planet. The Bizarro that antagonizes Superman is his own opposite, but no one calls him Bizarro Superman, probably because he’s the first Bizarro introduced in the comics. Anyway, along with the Bizarro Superman, there is also a Bizarro Lois Lane, a Bizarro Jimmy Olsen, and so on and so forth. It was inevitable, with a setup like this one, that someone would eventually create a Bizarro version of Batman (we call him Batzarro, because comics), which is the one that my student was intrigued by. He asked me if there were Bizarro versions of the other members of the Justice League, and in my brain stuff with far too much comics trivia, I remembered that in fact there were, and I had the comic in which they appeared. “Us Do Opposite” is that comic. I was really excited that I had an actual hard copy of a thing that a student was expressing interest in, so I brought my volume of All-Star Superman for him to look at one day in the hope that he’d enjoy other things about the book besides the one page gag that is the Bizarro Unjustice League. Alas, it wasn’t meant to be; like I already mentioned, this student was more interested in the trivia of comics than the storytelling of them, so he returned the book to me satisfied but unimpressed by any larger notions of a tale well told. He just wanted to see the panel of the Bizarro Flash, the slowest man alive with a top speed of two inches per hour. Anyhow, that’s the story that always comes to mind now when I think about “Us Do Opposite.” The story itself is largely unremarkable: Superman finds himself trapped on the Bizarro planet with his powers fading, and he launches a desperate plan to rally the Bizarros to help him build a rocket that will fly him back up to normal space. He succeeds on the strength of his ability to adapt to the logic and culture of the Bizarros, culminating with him tricking Bizarro Superman into throwing him into space following a nonsensical insult that still confuses me (I vacillate between being impressed by the complexity of Bizarro grammar that Morrison has written and wondering if he just arbitrarily made some stuff up that vaguely matches the idea that Bizarros express ideas in a language built on words having the opposite meaning to what they have in English). This one’s a story about how even with his powers Superman is super competent. Contrasted with Superman in this issue is the character of Zibarro, a mutant among the Bizarro race who has grown with exceptionally high intelligence (for a Bizarro) and a perspective that’s more in line with humanity. I used to think that Zibarro was a sympathetic character put in place so Superman could interact with someone in a less confusing way than he does with the other Bizarros. There’s something undeniably tragic about a character who knows that he is fundamentally different from everyone else around him and suffers deep loneliness because of this knowledge. Zibarro just comes across in such an ill-mannered way though. His constant harping on his own genius in comparison to the rest of the Bizarros (while continually badgering Superman to look at his writing and to bring him along) rubs me the wrong way now. I see in Zibarro a character who, while he does have legitimate differences from his peers, has carved out his entire sense of identity by way of his “superiority.” Never mind that the Bizarros appear to be developing a working culture and their linguistic system, while slightly impenetrable to untrained listeners, has an underlying logic to it. Zibarro revels in self loathing, and I’m not entirely sure that Morrison and Quitely realize that’s how they’ve presented him. Despite Zibarro’s unlikeability, he does serve an important function in this story. Superman’s job is helping people, and Zibarro’s the only person on the Bizarro planet who demonstrates any kind of need. The rest of the Bizarros are content with their lives, but Zibarro needs reassurance that his life matters too; Superman points out that the Bizarro world must be getting smarter if it created a Bizarro as self aware and observant as Zibarro. It’s a nice moment for Superman that times back to the the series’s central premise. We also get a short scene in this issue where Lois Lane finally learns that Superman is dying (it’s about time), which sets up the impending climax. We’re moving forward into the last third of the series, and things are going to pick up speed a little. If you set aside the problem of Lois Lane in Morrison and Quitely’s All-Star Superman, my biggest complaint is that the macro arc of the series is extremely disjointed. Outside of issues where Lex Luthor appears (spoiler: he’s the main villain of the series), each issue is meant to be more episodic. I suspect part of this structure is derived from Morrison’s love of the Silver Age; the plotting style of comics from the ’50s and ’60s was to have a fully self-contained story in each issue that sets off from and returns to an established status quo (if you like to watch television, think of it as the structural difference between a sitcom and a serialized drama), and Morrison seems to be drawing heavily from that tradition in the way he approaches each issue. If you keep in mind that All-Star Superman was published in the mid-’00s when decompressed storytelling in comics was at its most extreme (decompression is a narrative style in comics where the action in the story is spread out over a very large number of panels, allowing for significantly fewer story beats per issue; it’s receded in popularity slightly, but many creative teams still write story arcs designed for consumption all at once instead of in monthly increments), then the use of this episodic, self-contained format makes great sense; Morrison’s calling back to an older era in Superman comics, and he’s employing structural as well as mythological features of those old stories. Still, my comics habits, having been formed through a preference for trades over floppies, means that I want each issue in a series to feel more like a chapter than a short story; Morrison and Quitely are working really hard to go for the short story feel in this series. Now having said all of that, we have to contend with the fact that this is the first issue of the series that ends without a feeling of resolution. Superman faces off against the new Bizarro threat, and at the moment of crisis he gets sucked into the Underverse with the Bizarro planet. The day is saved, but he’s trapped and rapidly losing his powers in the absence of radiation from a yellow sun. This issue’s clearly designed to be the first of a two-part arc, which would have been a big deal in the Silver Age. The only problem with all of this stuff about Silver Age style plotting is that the issue’s part of a mini-series where we’ve been promised from the first that this was going to be a story about Superman dealing with his mortality. He has a death sentence hanging over his head, and the Bizarro plot doesn’t really do anything with that idea. Superman saves the world and finds himself imperiled, but this issue’s so heavy on action that there are no moments of contemplation like what has been regularly worked in to all the previous entries. Superman traveling in time to prevent missing the death of his father, trying to talk Luthor into reforming, confessing his identity to Lois (note, though, that all of these endeavors are marked failures for Superman, and they carry with them the suggestion of his need to accept his limitations at a point where his power appears limitless) all remind the reader that we’re looking at the adventures of a man who knows he’s dying; none of that subtext is present here. The only thing I can think is that maybe Morrison and Quitely saved the pathos of this story for its second part; I’ve not re-read it yet, so its particulars are still fuzzy in my mind. On a different note, one aspect of this story that irritates me immensely is the use of Allie, the fat Black woman, as the expendable character meant to demonstrate how dangerous the Bizarros are. She’s a perfectly well sketched character (I find her epicureanism charming), but this issue is her first appearance, and it’s clear she’s only given some depth so the reader can feel bad when she’s infected with the Bizarro virus and Lombard throws her out the window. In a cast that’s overwhelmingly white (Morrison and Quitely don’t attempt any kind of race- or gender-bending of legacy Superman characters here), the decision to introduce a Black woman just for the purpose of killing her off to let everyone know the issue’s threat is serious business comes across as incredibly callous and insensitive. Allie serves as yet another example of how creators should not integrate women and people of color into their stories. Altogether, this is a weird issue; it’s far from my favorite. There’s a heavy dose of action, probably more than what’s been built into previous issues, and the emotional beats are largely unmemorable. Things do get better from here though; the major arc needs to get moving soon, and from what I remember the last half of the series will accelerate substantially with its core story.